Pins are a four piece band from Manchester comprised of singer/guitarist Faith Vern, guitarist Lois Macdonald, bassist Anna Donigan and drummer Sophie Galpin. 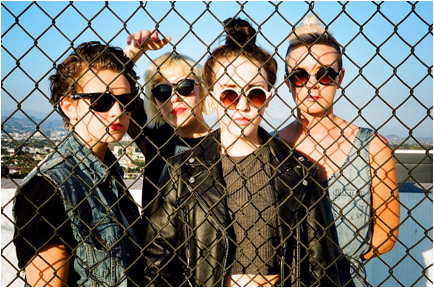 Having formed in 2011, Pins released their debut album in 2013 - Girls Like Us, and toured with a bunch of diverse bands, including Warpaint, The Fall, and Sleater-Kinney. Fast forward two years, their latest - Wild Nights, has just been released. Wild Nights was recorded in famed Joshua Tree with producer Dave Catching. 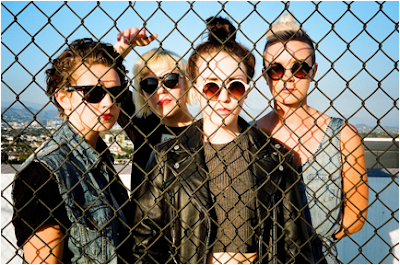 Pins are currently in the midst of their own headlining tour and here, Faith and Lois share a little bit about the band that is known as Pins. 1. What inspired you guys to start a band? Faith - the first Christmas gift I recall was a keyboard, I got my first guitar when I was 12 and I had hundreds of imaginary bands as a teenager, it's in my blood.. My grandparents are musical, maybe it's down to them. Lois - I played piano since I was a kid, but it was quite a solitary instrument. When I start playing guitar it was easier to meet people to play with, and I really love the social aspect of being in a band. My parents aren't 'music' people, although they have a few great records, and once I started going to local punk shows I felt like I'd found my own little scene. Faith - I like old 60s and 70s sounds, from The Ronettes to T-Rex. I listen to lots of new garage music Black Lips, Ty Segal, Thee Oh Sees etc.. And 90s bands like Hole, Bikini Kill, Nirvana all got me at first listen. Lois - I love riot girl, and bands like verruca salt, and distillers. I also love the garage girls of the 60's records, nick cave, timber timbre, tame impala, hookworms, no joy. All sorts really, depends what mood I'm in. 3. How do you feel the Manchester music scene is compared to other cities you've played? Faith - it's sort of the same, in a good way... Nearly every city I visit has interesting little sub-cultures going on, people trying to spark some excitement, it's great. Lois - yeah I'm sure there's lots of scenes in Manchester we don't even know about, there's a lot of cities surrounding us that have some really great bands too, Liverpool, Leeds, sheffield etc. 4. How was it working and recording in Joshua Tree? Faith - it was really special, we met some friends for life and made a record that we are proud of. Compared to Manchester, it felt like another world, I felt grounded and totally in tune. Lois - it was fun to just leave everything behind and just focus on why we were doing, and in a completely supportive environment. We didn't want it to end. 5. You've opened for some great bands; was there anything you picked up playing those shows? Faith - of course, mostly that it's music and we should enjoy it, playing a show should be fun. 6. What are some bands you are currently listening to? Faith - UMO & King Gizzard on repeat. Faith - I just picked up a reissue of a Bikini Kill record in NYC, I haven't found a turn table to listen to it yet but I'm excited about that one. I also have a bunch of Elvis 7" that my husband bought for me that I treasure. Lois - my favourite record ever is 'Nina Simone and Piano', I have it on vinyl and it's my dad's old record. I love picking up old 7"s in charity shops and have got quite a lot now. My favourite one tho is the first MONEY single, released on Sways 'who's gonna love you now'. -Anything you're looking forward to being released? Faith - the next Deap Vally record! Lois - king gizzard and the lizard wizard - I'm in your mind fuzz. Sadly, not the ltd. edition coloured one tho. -Last movie you saw & show you went to? Lois - I watched St. Vincent on the plane, it was great. And Drenge was the gig too, we were there together! It was at the knitting factory when we were in NYC.